As we have come from the exhilaration of the first Joint Anglican Synods of October 2-6, 2017, it is with great joy and praise to God for the wonderful celebration of life together in Full Communion. How moving it was as the Document of Full Communion (communio in sacris) was signed as the congregations of the four jurisdictions spontaneously broke into the Doxology. After 40 years of separation, the four jurisdictions, the Anglican Catholic Church, the Anglican Church in America, the Anglican Province of America and the Diocese of the Holy Cross, celebrated a Pontifical High Mass with each Archbishop (Bishop) participating in a vital part of the Ceremony. I was the one appointed to preach at this Eucharist. It was truly the culmination of a joyous week for all attending the much anticipated event in Atlanta, Georgia, at the Ravinia Crown Plaza Hotel. On a personal note, I attended the Congress of St. Louis 1977 as an observer, along with others from what was an early iteration of the Continuing Anglican Church movement. There were a number of those who had been leaving the Episcopal Church beginning in the late 1960s and had organized into parish communities. A number of clergy who attended the Congress were part of a significant body called the American Episcopal Church, which had attracted young evangelicals who were interested in Anglicanism not from the Episcopal Church. I was one of those. We went as interested observers to witness the events of the Congress. What impressed me the most then was the anger and bitterness on the part of so many of the clergy and the laity who were there from the Episcopal Church. The bitterness was understandable, upon reflection, as they felt they were losing or had lost their Church. On the other hand, what I witnessed along with so many of those who were at the Joint Synods 2017, was the happiness and joy of coming together after those long 40 long years of separation. For those of us from the APA and our Dioceses, it was an extremely busy time of committee meetings and two Diocesan Synods. The DEUS and DMA both held their Synods on Wednesday. These two Synods were followed on Thursday by the APA Provincial Synod. It was truly exhausting but, praise God, we finished all the scheduled business and had a good time doing it. My report and charge for the DEUS Synod, and that of the APA Synod, are on our Anglicanprovince.org webpage. How do we live in this new relationship with our fellow Traditional Anglicans? Unlike love at first sight, and the strong emotional feelings one has in that situation, we have known most of our new partners for many years. We have sometimes felt in competition with them and often see their weaknesses better than we see our own. It is easier to recognize the faults in others than in one’s own self. How do we continue to develop relations with the other Traditional Anglican clergy and laity? We begin by inviting clergy to our various meetings and gatherings such as the Winter Clergy Conference, Women’s Retreats, local clergy gatherings, parish picnics. When traveling, seek out local parishes and missions of our Communion Partners and make it known who you are. We will also make it a point to invite our Communion Partners to be represented at our Synod. Developing lasting relationships in any life circumstance takes effort, patience and time. We must make a commitment to work hard at making these relationships successful. And last, but not least, we must pray as we are instructed by our Lord to be one even as he and the Father are one. Having the Synod later in the year makes it seem as though our Winter Conference comes rather quickly after the Synod. I have set it toward the end of January 2018 in order to give a little extra time to get things prepared and give everyone a chance to get registered. All clergy (and spouses) and deaconesses are invited from any part of our Province, along with the DEUS BAC and Standing Committee Members. The active clergy of the DEUS are expected to be there unless excused by the Bishop. Registrations will be done online via of our APA webpage. Registration deadline will be January 2, 2018, so we can have an accurate headcount for event materials, seating and meals. There is small registration fee this year of $20, that will be collected upon arrival (checks and cash only). Please note: you will need to make your hotel reservation directly with the hotel (the online registration form does not reserve your room). For reservations at the primary hotel, the Hampton Inn, use the group code of “APA 2018 Winter Clergy Conference” to get the APA discounted rate of $99. There are only 25 rooms at this rate so don’t delay. The overflow hotel is the Quality Inn. Please use our group code of “Anglican Clergy Conference” to receive the reduced rate of $75. Both hotels have free parking and free hot breakfast. This will be the first ever Conference to be held at All Saints’ Church in Palatka, Florida, where Fr. Frank Bartlett is the Priest-in-charge. They have a lovely church building and a nice accommodating parish hall. All events will be at the church which is less than 7 miles from the hotels. Palatka is a historic old city on the St. Johns River. If you chose to fly, the Jacksonville, FL, airport is closest or the other option would be Orlando. The actual Conference will start with the dinner on Wednesday evening, January 24. There will be Morning Prayer on Thursday with a 12 noon Holy Eucharist. (Lunch will be provided at the church.) There will be a special luncheon for the clergy wives at a well-known restaurant on the River. The Thursday afternoon Session will be followed by Evening Prayer, fellowship hour and dinner, featuring local cuisine. The DEUS Bishop Advisory Committees and DEUS Board of Examining Chaplains will be meeting prior to the start of the Conference. On Friday, the Standing Committee for the DEUS will be held from 9:00 a.m. until 12:00 noon. The Proposed Schedule is on the last page of this Epistle. I encourage you to make your hotel reservations early. Election at DEUS Synod 2017 of Members and Officers of the Standing Committee: The Very Rev. J. Gordon Anderson was re-elected President and Dss Debbie Kidd was elected to replace member Karyn Cozad, who had finished her term. Dss. Kidd was elected as Secretary. Election at DMA Synod of Members and Officers of the Standing Committee: Canon Jennings was re-elected as President and Fr. Ben Holland was elected to replace a vacancy. Rick Watson was re-elected Secretary. Election at Provincial Synod 2017 of Officers and Members of Provincial Council were also held. (Names not available at time of print). The Diocese of the West celebrated a much-anticipated day on October 28, 2017, with the Ordination to the Sacred Priesthood of Deacon William Baker and Deacon Christopher Smith, at St. Andrew’s Anglican Church, Jacksonville, Oregon. Four years ago, I ordained both of these men as Deacon, and it was my pleasure to ordain them to the Priesthood. They have been serving at St. Andrew’s Church and over these years and have been encouraging each other along the way to this most special day of Ordination. They both con-celebrated their first Mass on Sunday, October 29, with Vicar General Robert Hawkins and me there to assist. Father Smith will serve as Rector-elect of St. Andrew’s, and Father Baker will spearhead efforts to establish a new mission in the Southern Oregon area. On October 22, 2017, the Rev. 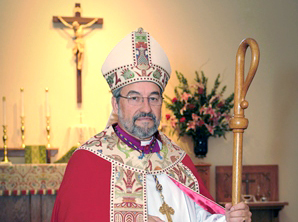 Canon Robert W. Hawkins, Vicar General, DOW, attended the inaugural service of Holy Angels Anglican Church, La Center, Washington, a church plant sponsored by St. Michael’s Anglican Church, Wilsonville, Oregon. The Rev. Father Vince Varnas celebrated Holy Communion, and has been appointed Priest-in-Charge of the new mission. Holy Angels meets in the La Center Grange Hall, and has been warmly received by the community. Father Varnas has been invited to introduce Holy Angels at the upcoming City Council meeting, and is planning several local activities to raise awareness of the mission. In November 2017, St. Alban’s Cathedral, Oviedo (Orlando), Florida will be celebrating the 40th anniversary of its founding. Founding members or their families will be returning for two special events: a ‘70s Dance on Saturday, November 4, and a Founders’ Dinner after their Annual Meeting, on Sunday, November 22. There will be a presentation of pictures from the very early days highlighting development of property, renovations, additions and new buildings. Memorable people who were and are a part of this special place in the life of the parish and the APA will be featured. May you have a wonderful Thanksgiving and Advent Season. DOW: Deacon William Baker was ordained to the Sacred Order of Priest on October 28, 2017, at St. Andrew’s Anglican Church, Jacksonville, OR. Fr. Baker will spearhead efforts to establish a new mission in the Southern Oregon area. DOW: Deacon Christopher Smith was ordained to the Sacred Order of Priest on October 28, 2017, at St. Andrew’s Anglican Church, Jacksonville, OR.. Fr. Smith will serve as Rector-elect of St. Andrew’s Church. DEUS: Mr. Robert Shoup will be ordained to the Diaconate on November 11, 2017, at St. Patrick’s Church, Brevard, NC. Deacon Shoup will also serve as Deacon at St. Patrick’s Church. DEUS: The Rev. Mr. Daniel Rieger will be ordained to the Sacred Order of Priest on November 25, 2017, at St. Mary the Virgin Church, Delray Beach, Florida. He will continue to serve as the Curate at St. Mary the Virgin Church. DEUS: The Rev. Ernest Pinto has transferred from the APA/DEUS to the Anglican Church in America, Diocese of the Missouri Valley. DOW: The Rev. Ian Dunn will be installed as Rector of All Saints Church, Prescott, AZ, by Bishop Robert Giffin on December 9, 2017. DOW: The Rev. Benjamin Holland has transferred from the Reformed Episcopal Church and received into the Diocese of the West, APA. Fr. Holland will serve as a Priest at St. Mary Queen of Heaven Church in San Antonio, Texas. St. James of Jerusalem, Sarasota, FL. St. Mathias Mission, Dothan, AL. Fr. Tracy Smith, Fr. Sweeney and wife, Alice, Fr. Cunningham’s wife, Diane; Bishop Shaver, Postulant Walter (Jay) Gould, Fr. Conway, Fr. Carter; Fr. Poole’s wife, Denice; Bishop Hanlan’s wife, Joan; Fr. Keithly Warner, Fr. Bakley; Retired APA Treasurer, Bill Jourdan and wife, Doris, Fr. Daughtry; Bp Dorman; Fr. Gardner. Oct. 1-6 Anglican Joint Synods, Atlanta, Georgia, (with ACA, ACC, and DHC), APA Clergy Conference, Diocesan Standing Committee meeting, House of Bishops meeting, APA Provincial Council meting, Diocese of the Eastern United States Synod, and APA Provincial Synod. Oct. 15: Episcopal Visitation, St. George Church, Ocala, FL. Oct. 26-30: Ordination to Priesthood of Deacons William Baker and Christopher Smith, St. Andrew’s Church, Jacksonville, OR and Episcopal visitation and Confirmations. Nov. 5: Celebrated Eucharist, St. Alban’s Cathedral, FL. Nov. 12: Celebrated Eucharist, St. Alban’s Cathedral, FL. Nov. 15: meeting with prospective clergyman. Nov. 16: meeting with prospective clergyman. Nov. 19: Episcopal Visitation, 40th Anniversary, St. Alban’s Cathedral, Oviedo, FL. Nov. 25: Ordination to Priesthood of Deacon Daniel Rieger, St. Mary the Virgin, Delray Beach, FL. Dec. 16-17: Confirmation and Episcopal Visitation, St. Peter’s, Kingsport, TN. Dec. 9-10: Installation of Fr. Ian Dunn as Rector of All Saints, Prescott, AZ. Oct. 1-6: 2017 Anglican Joint Synods, Atlanta, Georgia, (with ACA, ACC, and DHC) APA Clergy Conference, Diocesan Board of Examining Chaplains meeting, Diocesan Standing Committee meeting, House of Bishops meeting, Diocese of the Eastern United States Synod, and APA Provincial Synod. Oct. 19-21: Retreat Conductor, Diocesan Women’s Retreat, Monastery of the Holy Spirit, Conyers, Georgia. Oct. 26: All Saints’ Church, Mills River, North Carolina, Confirmations. Nov. 4-6: All Saints’ Church, Mills River, North Carolina, Episcopal Visitation and Confirmations. Nov. 7: Meeting with delegation from the Anglican Catholic Church (ACC) Province of South Asia in Athens, Georgia. Nov. 11: Ordination of Robert Frank Shoup to the Sacred Order of Deacons, Saint Patrick’s Church, Brevard, North Carolina. Dec. 1-4: Saint Philip’s Church, Blacksburg, Virginia, Symposium on Iconography, Episcopal Visitation and Confirmations, Blessing of Icons. Oct. 02–06: 2017 Anglican Joint Synods, Atlanta, Georgia, (with ACA, ACC, and DHC), Diocesan Standing Committee meeting, House of Bishops meeting, Diocese of the Eastern United States Synod, and APA Provincial Synod. 04 Rev. O. Michael Cawthon, Sr.
30 Rev. Robert Cheeseman, USAF, Ret. Please contact the APA Office at 1-800-480-1087 or at apadeus@cfl.rr.com if any of dates are in error or a date has been omitted.